I’ve been away from Single Frame Stories for a few weeks. I haven’t been inspired with any truly creative interpretations of the prompt word(s) until this round. The prompt is “I Believe”. And taking a look around Second Life lately, that has led me to create this image. Love is not a four-letter word in the sense that it is not to be taken lightly or in haste. Bandying about the term when you have barely known someone for a week is a curse upon the meaning of the word. I’ve never been a believer in love at first sight. Lust? Sure? Infatuation? Maybe within an hour or so (excluding the times one might be wearing beer goggles). But to love someone you need to know what makes them who they are. You need to understand their warts and idiosyncrasies and still experience that depth of feeling only love can bring. Love is all of the letters of the alphabet, the words of every language, every story written across all time. 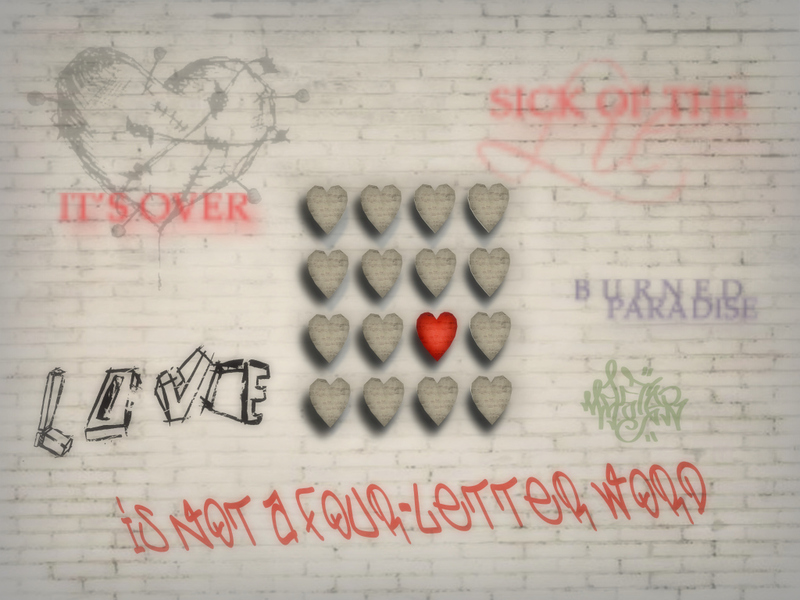 Love is NOT as simple as a four-letter word. Surprisingly, this week’s Single Frame Stories prompt, “Creativity”, pretty much stumped me. I’m not an artist. I take photographs and play around with processing them, but I am hopeless at creating anything from scratch. I have my own style, but it’s nothing ground-breaking or heart-stopping. It’s just what I do. It fills my time and it helps me relax. I just get in a zone and don’t see anything else. My senses are heightened, and they are fixed on what I am doing – trying to create my interpretation of the scene I have captured. Results may vary. So…feeling chastised by a dead poet, I intended to go into Second Life today and travel the grid, trying to find something that could tell the story of Creativity in a single shot. I was actually anxious about it, wondering what I could possibly come up with. And then, I remembered a photo I had taken at Runestone, but hadn’t used in my original post. This painter’s easel has been at Runestone for as long as I have been going there. And it’s one of my favourite spots. I can never walk past it without grabbing a palette and putting brush to canvas, pretending to recreate the scene of the house across the water, playing at being an artist. When I opened the photo, I knew I could show in one shot how I feel when I am working to finish a picture: focused on the object, with everything else around me a blur. If you want to participate in Single Frame Stories, you don’t have to be a blogger. All you need to do is upload your interpretation of Creativity, in a single photo, to the Single Frame Stories Flickr group. You can open a free account there, if you don’t already have one, and participate in this remarkable project. The deadline this week is Friday, so there is time to display the work at the Single Frame Stories SL10B installation. Go ahead…give it a shot. You may find yourself in the zone, too, once you’ve overcome your hesitation to share your creativity.